This week, the challenge was to design and create something entirely from your preexisting stash of fabrics! I have lots of fabrics that I've treasured, some that I bought almost 10 years ago! But the catalyst to this week's collection was a fabric that I bought at Fabric Depot about two and a half years ago that I've been most excited to use: a neon, chartreuse, fleece-backed neoprene. While most would run to the hills to avoid shocking colors, I bee-lined towards them! My mamma raised me in full technicolor and if you think I like colors, you should meet her! She's one of the most vibrant and colorful people that you will ever meet and she always encouraged me to be me, through my high school days of pleather pants and rainbow polyester shirts (90's much? 😂) all the way to now with all of the kids' sewing that I do. With that being said, I wanted to make some really sweet, super playful and girly looks! 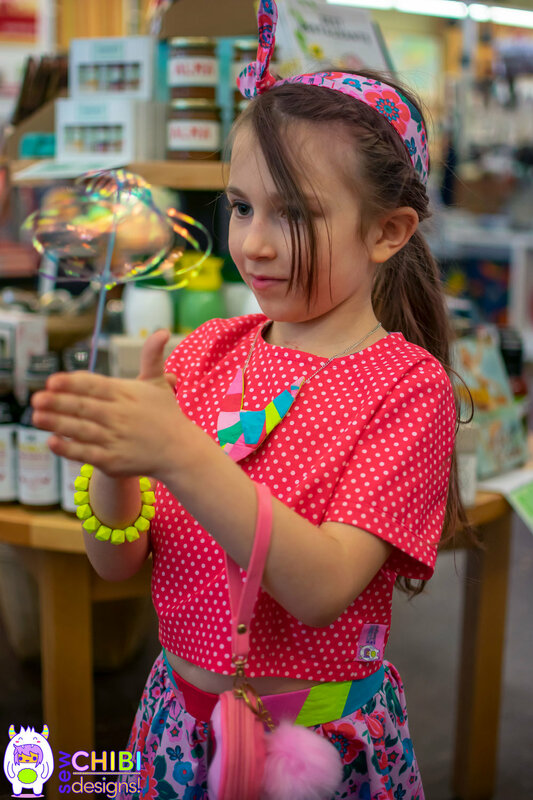 The fashion I like to make my kiddos is reflective of their bubbly and silly personalities: bright, diverse, and, most importantly, with a sense of humor. There's something about their smiles when they see fashion that they can identify with that is really special to me. Making things that are surprising and zany is what makes sewing fun to me and deeply fulfills my creative side. So for my 4 year old, I wanted to make something that I knew she would love: 🍦Ice Cream🍦! 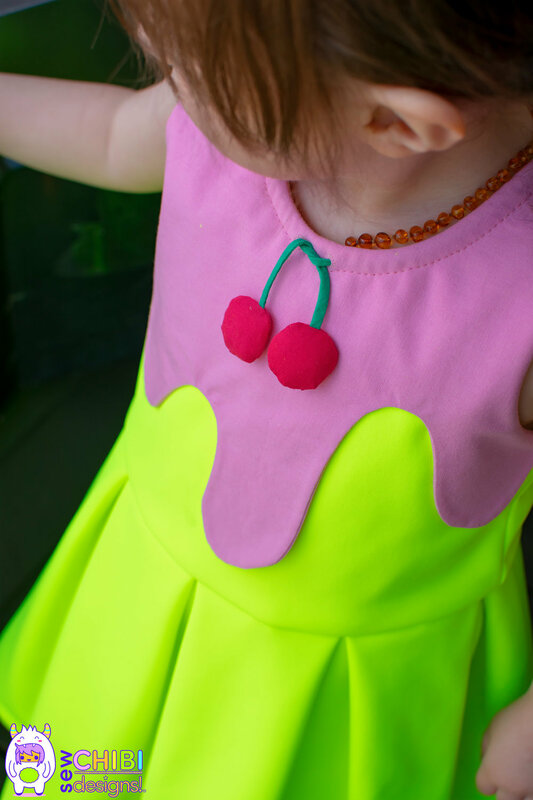 To pair up with the chartreuse neoprene, I wanted the ice cream part to be bubblegum pink. I looked to my stash to find a print that would complement those two colors and chose a pink, Free Spirit, floral (as well as a matching pinkish red polka-dot cotton fabric) for an outfit for my 6-year-old. Why? It's because together they make a rainbow color story and we are madly in love with rainbow things in our family! 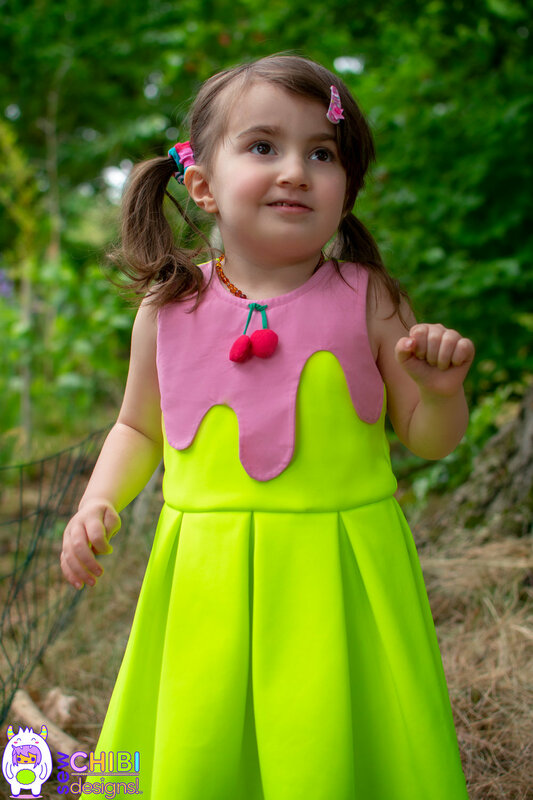 Since my youngest is still so small (to me, anyway), I thought it would be a fun opportunity to make her an ice cream dress! I used the Blake dress (by Mingo and Grace) with pockets as a base and drafted added a lined "ice cream" overlay in the bubblegum pink. For the neckline, I created a casing between the layers with top-stitching, opted for stitched eyelet openings over inset ones and inserted an itty bitty green piping into the channels, setting them into the shoulder seams. For years, I've been in love with adding puffed details to kids clothes. So I made tiny puff "cherries" for the green tie ends because an ice cream is best with cherries on top, right?! As an accessory, I made her a pair of rainbow-pieced and floral scrunchies. Neoprene is such a great fabric for those with curious kids (ahem, those that like to play hard) because it doesn't wrinkle and this particular fabric washes really well too! To be honest, she got the dress a little dirty after our outing (but I still needed a few more shots because she couldn't be bothered with smiling when we were out, lol), so when we got home I washed it on a gentle cycle. It came out looking just as good as before! 😱 In fact. all of the garden photos were actually taken after it was washed! 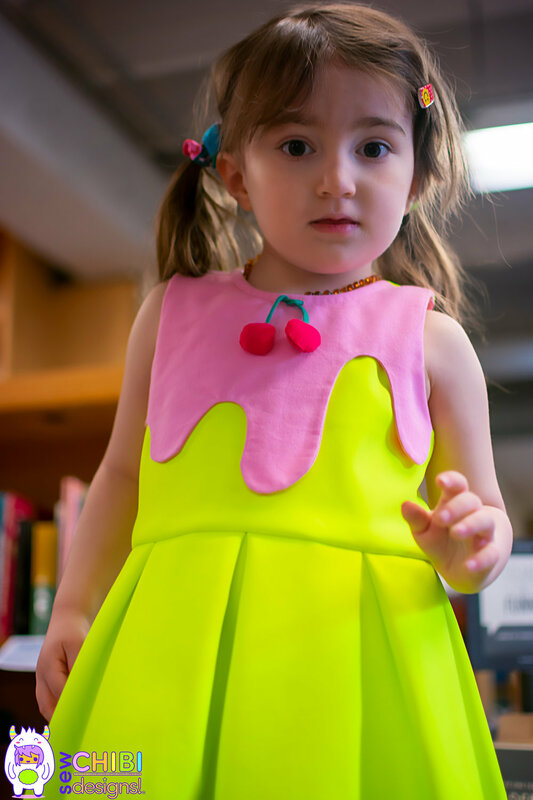 She loved her dress so much that she requested to change out of her pajamas in the middle of the night to change into her ice cream dress and has been living in it ever since! I did something a very rarely do (because I have a love/ hate relationship with hand-stitching) and slip-stitched the lining instead of just stitching in the ditch. Neoprene shows every little stitch and excessive stitches take away from the smoothness of the fabric. I thought about tacking down the ice cream overlay and then this image of Akira exploring her dress and ripping those layers apart had me quickly nixing the idea. 😂 One of the first things she did was run her hands between the layers when I tried the dress on her. This was my first Blake dress to make and the subtle pattern details and Farrah's helpful videos helped make the dress come together swimmingly! I can't even handle how much I love that racerback bodice on Akira's chubby little back! This dress will be in heavy rotation throughout the summer for sure! click here to check out all of week 2's designs! Sephira, my middle girl, loves everything from Mandopop (mostly pop music from Taiwan) to Bowie to ultra girly stuff and everything in between! This week, we went girly. I wanted to make her a crop top set but I didn't have a crop top in my repertoire that I was happy with. I decided to draft her blouse from my personal blocks (to her dimensions) in Illustrator. I added darts to the front and back to give the blouse a slightly more fitted shape and a button placket in the back. The sleeves were slightly eased to maintain crisp lines and also have a little cuff finish. For the bottom, I made a gathered circle skirt with a fitted waistband and invisible zipper closure rather than an elastic casing to maintain the clean lines of the outfit. I used a very tiny, narrow, rolled hem for the skirt bottom. For a peekaboo surprise, I made the waistband using a quilting technique that I have frequented in the past: improv piecing! Basically, I take scraps of fabric (the more irregular the better) and match them up with other pieces. Then I sew, using a super short stitch length, directly on a paper copy of the pattern piece. The short stitch perforates the paper so it can be carefully torn away! It's a lot of fun! It gives the waistband a sort of abstract art, belted look. I used the same technique to make a geometric fabric "kitty" necklace with nickel chain and lobster claw clasp closure. She was really excited to have a proper necklace and it was her favorite animal too! To finish her look, I made a hair accessory from my own free pattern and tutorial that I made ages ago but haven't made in a while: a bunny ear headband! It wraps around her head and then the ends have wire in them (I tucked the wire ends and inserted the wire into a channel, then stitched the openings closed to keep them in place). Instead of knotting the ends, all you have to do is just twist a couple of times and that's it! Stays in place perfectly too! As a last minute garment (not pictured) I made matching green knit biker shorts (using a pattern of my own: the Natsu shorties) so my little girl could spin and prance and play to her hearts' content while still maintaining her modesty. Geometric Kitty Necklace was also improv-pieced and attached to a chain with lobster claw clasp. Bunny Ear Headband with wire tips to twist twice to stay in place. Green Biker Shorts made by shortening my pattern, the Natsu Shorties, and making a folded hem. I took a secret video of our walk back (after we actually had brunch) with her skipping and twirling and having fun in her outfit! 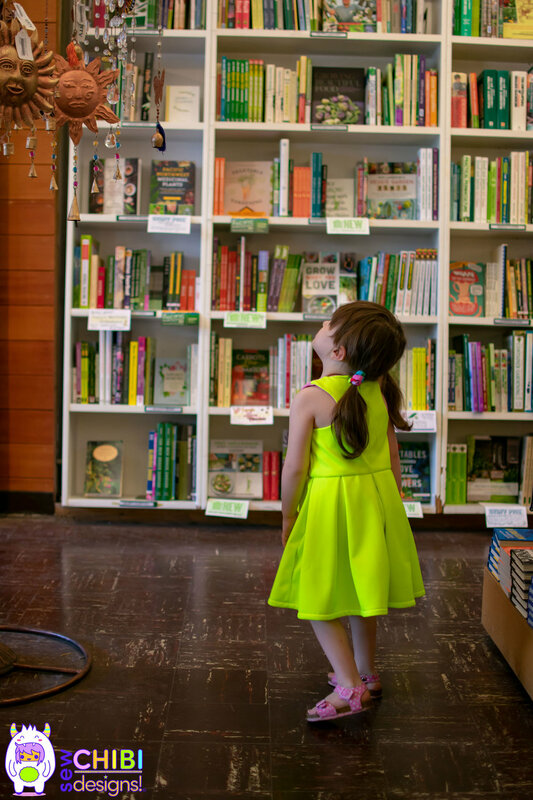 We stopped in a few places along the way; one place that's a must is Powell's Bookstore! 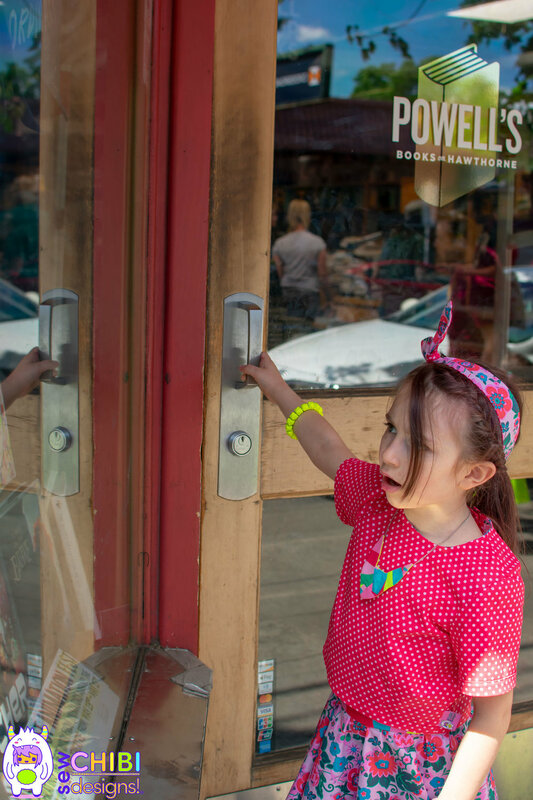 If you've ever been to Portland, Powell's is a must to visit! the Pusheen kitties were calling her name, lol. If you love them like we do, then you'll love their Christmas outfits I made! More about those in the next issue of Kira Kira KIra! It was such a fun and whimsical week for sewing! I hope you like my Ice Cream and Sundays Collection as much as we do here! On our way back to the car after brunch at McMenamins! Newer PostWeek 3: Action Go!